My fondness for all things Lizzy House continues to grow with my newest quilt - a posh camping quilt, for the likes of the Travelux Pearl. I decided to make this quilt almost exclusively using Lizzy's out of print Constellations line, with a few jewels and pearl bracelets tossed in for good measure. I'm banking on the tone-on-tone gray metallic bracelets to make for a nice moody background *fingers crossed*. It's taken me months of internet stalking and LQS hopping to track down two missing prints from this line. A big shoutout goes to the generous IG peeps who resolved months of searching in a matter of mere minutes. For those of you that helped, thank you! 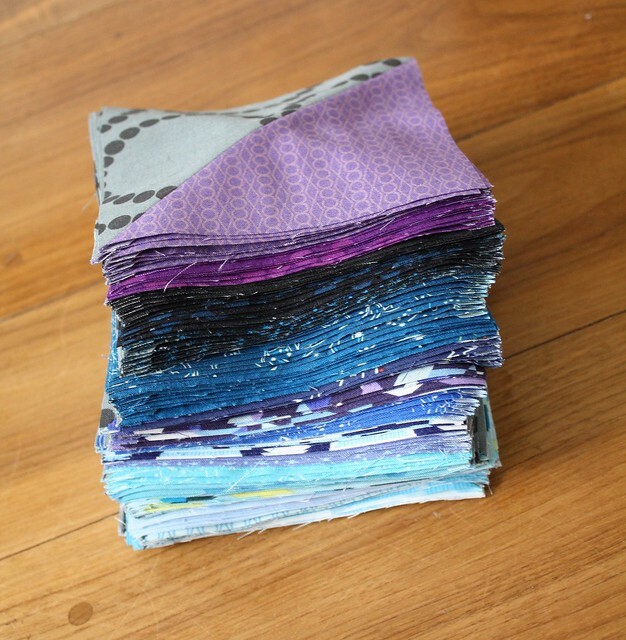 168 HSTs pressed, trimmed and ready to roll. I'm just waiting on two more prints to arrive and I'll start working on a final layout. Then I think I'll take a little break from HSTs for a while. Its sure going to brighten the trailer! Wish I had one! This is going to be awesome! 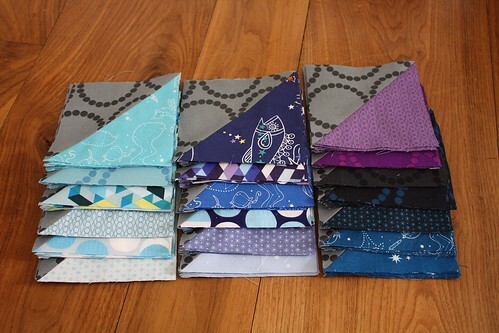 I'm also trying to track down Constellations fabric, so if you end up with extra, I will totally take it off your hands! Kelsey this is going to be gorgeous. Somehow I can't imagine you roughing it with camping, so a posh (and sparkly) camping quilt is perfect! I think you need to invest in a bloc_loc for the next time you're thinking about HSTs - honestly, it takes so much pain out of the trimming! This is just looking fantastic. Really love that line of fabric and the shiny pearl bracelets. I think you can pretty much do no wrong with this combination. 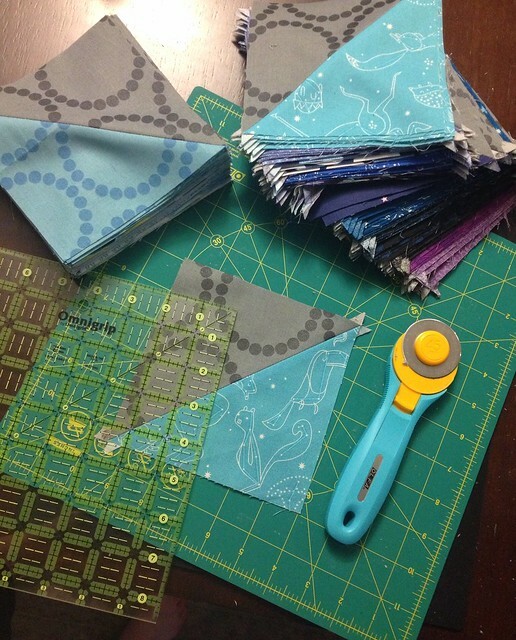 I have been sitting on a Constellations fat 8th bundle for many moons (pun intended!). 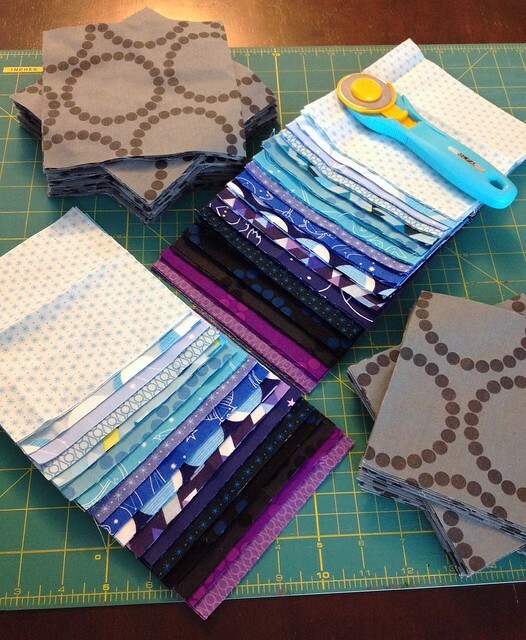 I want to make my husband a napping quilt but haven't settled on a pattern. Excited to see how yours turns out! This is going to be amazing! I love that fabric.